Cancer researchers spend a lot of time looking for good targets: potentially druggable molecules (mostly proteins) that affect cancer progression. The laboratory of Stephen D. Nimer, M.D., director of Sylvester Comprehensive Cancer Center at the University of Miami Miller School of Medicine, has spent the past decade investigating an enzyme called PRMT5, which plays a role in leukemia, lymphoma and other cancers. Their work has inspired an entire subset of PRMT5 research. PRMT5 is a busy protein, helping control expression of a number of genes. It regulates cellular communication, modifies DNA-packaging proteins called histones and works closely with p53, which monitors genome integrity and halts cell replication, so cells can either repair their DNA and re-enter the cell cycle or, if the DNA damage is too extensive, trigger apoptosis (programmed cell death). 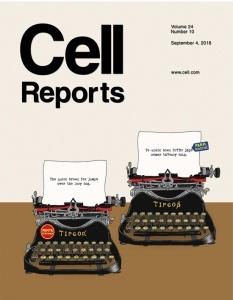 In a study published on September 4 in Cell Reports, Dr. Nimer and colleagues focused on how PRMT5 levels affect DNA repair. Specifically, they were looking at a mechanism called homologous recombination (HR), during which genetic sequences are transferred between strands to repair DNA breaks. In the paper, Dr. Nimer, first author Pierre-Jacques Hamard, Ph.D., and other team members reported that depletion or inhibition of PRMT5 impairs HR, allowing more error-prone DNA repair to occur. Eventually, p53 steps in and triggers cell death. It might seem counterintuitive to disable DNA repair mechanisms, but it is an intriguing anti-cancer strategy. Tumor cells are, by definition, damaged, and therefore need all the repair help they can get. Dr. Nimer and others believe inhibiting PRMT5 could take away this advantage and help cancer cells die. But inhibiting PRMT5 alone might not be enough. The protein is also used by normal blood-producing cells, raising some concerns about potential treatment toxicity. That’s where another class of cancer drugs, called PARP inhibitors, enters the picture. PARPs are a family of enzymes that, among other things, also orchestrate DNA repair. The team also showed that PRMT5 and PARP inhibitors work together against cancer. In fact, the anti-PRMT5 agent resensitized cancer cells to the PARP inhibitor. This could be a good way to take advantage of PRMT5 without causing too much collateral damage. There are already FDA-approved PARP inhibitors available to patients, and PRMT5 drugs may not be far behind. Pharmaceutical company GSK has a drug in clinical trials — a hopeful sign for patients.